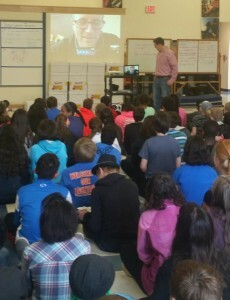 On Wednesday May 4th, 2016, the 6th grade had an amazing opportunity to Skype with the author, Kelsey Timmerman. He is the New York Times Bestselling author of the book WHERE AM I WEARING? A Global Tour to the Countries, Factories, and People That Make Our Clothes. During our interview of Timmerman, scholars learned about how he conducted research with the people he met, what his experience was truly like and what they can do as global citizens. McAuliffe 6th graders read Timmerman’s book in their ELA classes as part of book clubs. As they read, they looked for Timmerman’s purpose for writing the book. Reading the stories he told, gave 6th graders a face to the workers working in the factories they have been researching for their spring expedition product. Additionally, in geography, scholars took another look at the lives of shoe factory workers Dewan and Zu Chun (From Where am I Wearing? ), who live in China. To learn more about Kelsey Timmerman, visit his blog whereamiwearing.com.